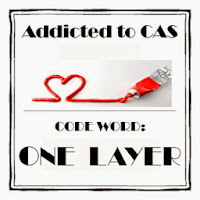 Today I have a really CAS card that I created for four CAS challenges! I wanted to make some teacher cards to sell at our church fair this October - so used the opportunity of these challenges to do so! As you can see - it's a one layer card with nothing but stamped images on it. 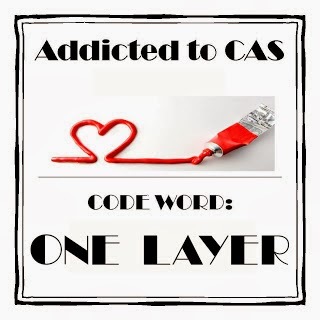 CAS, CAS, CAS!! Well, here we are in November, can you believe it??!! AND it's Thursday - which means it's time for a new FUSION challenge. 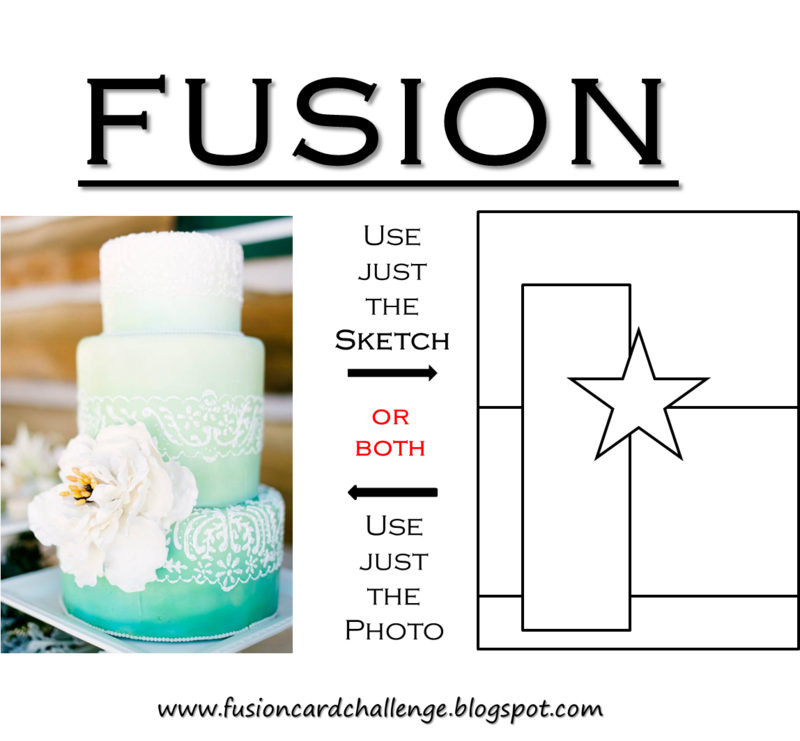 We can be inspired by the lovely ombre colors, the cake, the rose or this fun sketch - or you can do a FUSION and be inspired by both! I was inspired by the rose and the ombre color for my card today. 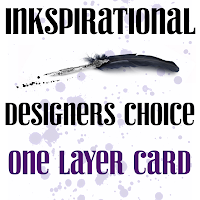 To get the ombre effect on my CAS card - I used one of my square clear acrylic blocks - brushing Ranger Distress Markers (Salty Ocean, Broken China and Tumbled Glass) over the block in three sections- the darkest at the top and the lightest at the bottom. Then I spritzed the block about 5 times (every time you do this it will come out different!) and pressed the acrylic block (color and water side down) onto a panel of watercolor paper. I lifted the block off and picked up the panel to let any drops drip down. If there were big puddles I dabbed them with a paper towel - then dried the panel with my heat tool. I stamped the rose from Roses in Bloom by Waltzingmouse and the birthday sentiment from Cake and Candles by Avery Elle on the panel using Archival Jet Black Ink. I added 3 sequins from Avery Elle and layered the panel to a slightly larger black panel and then to the white card base. How will you be inspired with this week's Fusion Challenge? We hope you will join us and link your card over at the Fusion Blog - where you will all the details of the challenge as well as plenty of wonderful inspiration from the rest of the very talented Design Team! Accessories: sequins - Avery Elle, Glue N Seal - Ranger, Ranger Distress Markers - Salty Ocean, Broken China and Tumbled Glass, Mini Mister - Ranger, water. But I'm still making Valentines - because I just got some new goodies in the mail. 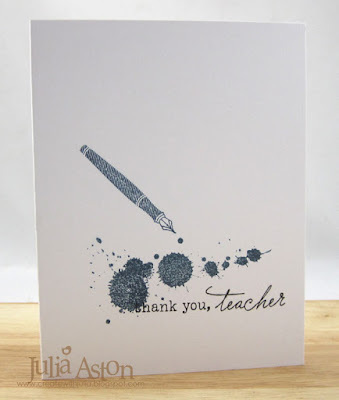 Today I'm using my new Paper Smooches stamp and die set - Love Struck. I die cut the circles with my new Stitched Mats Circles from Lil' Inker Designs. I die cut the red circle with the Snowfall die from Memory Box to look like places the arrows hit and missed! I only thought of it when I was looking for a red scrap big enough to cut the circle and I found this piece that I had cut the Snowfall on but hadn't used - and I thought "A ha"! that would look like a target full of holes from the arrows! - so there you go - that's how creativity strikes! 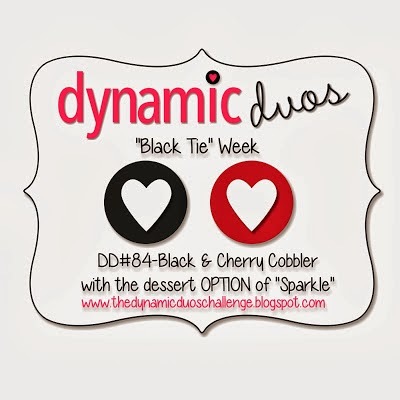 I was checking out my friends blogs and came across this beauty by Danielle - which led me to the A Day for Daisies blog challenge - to use Red and Pink. You need to use an A Day for Daisies image on your card - they are digital images. I just happened to have purchased a few some time ago (thanks to more inspiration from my friend Danielle!) but I fell in love with this new image - Love Clown so I bought it and of course was able to download it immediately! I used a stitched mats rectangle die to cut out my printed image. I colored the sweet clown with Copics, added a strip of hearts Washi tape along the bottom and 3 enamel dots in the top corner. I layered the mat to the card base with foam dots. Isn't she the sweetest?! Accessories: Washi Tape - Michaels, Stitched Mat Rectangle Die - Lil'Inker Designs, enamel dots - My Minds Eye, Copics: R20, R00, R35, E00, E31, E35, foam dots. The Life that is Waiting for Us. 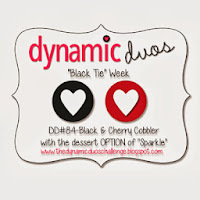 Dynamic Duos I even got the 'sparkle' in! 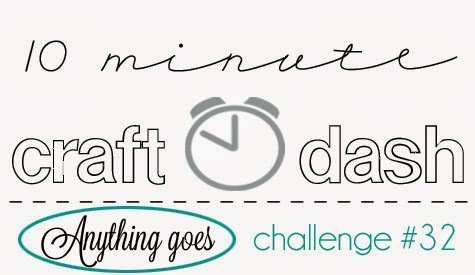 10 minute Craft Dash Anything Goes - this card took me 7 min 36 secs. I don't send New Year's cards but thought this sentiment worked for the New Year concept of starting out fresh. "We must be willing to get rid of the life we've planned so as to have the life that is waiting for us" Joseph Campbell. The stamp is from Rubber Soul. I'm taking Kent to the hospital this morning for his shoulder surgery - he'll be there overnight but hopefully ready to go home by noon time. He's been in such pain from it - he's excited to finally be getting it 'fixed'! 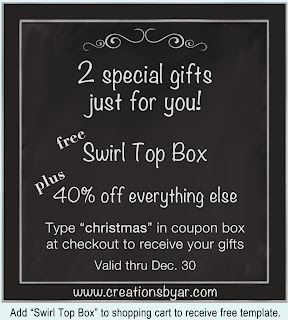 She's offering a free Swirl Top Box template and 40% of everything else! Well, Halloween is almost here so the cards are done - and I know Thanksgiving is next up at bat - but today I jumped right over to Christmas for two challenges. First up I used a long forgotten technique that I learned over on Split Coast last year (and LOVED!) called Faux Patina - here are Judy's instructions over on SCS. And here's a close up of how this technique looks when you are done. My card is one layer - just the card base - I only added 4 little gold half pearls to it. First, I embossed my card base after inking the front panel of the folder with Sahara Sand Ink. I removed the card and washed the ink off the folder. Then I sponged over the card with 3 inks, Taken With Teal, then Always Artichoke and finally with Really Rust. To finish it off, I ran my Versamark ink over the embossing than sparingly sprinkled gold embossing powder over the top, brushing some of it off before using the heat gun as you only want the gold scattered around the card - not solid - This is a really easy - really impressive looking technique don't you think?! I love the soft subtle mix of all the colors on this. For my next card - I was happy to use my Memory Box snow globe that has been sitting in it's little envelope since I bought it last year! 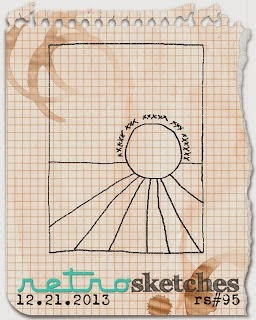 I used Cas on Sunday sketch for my card - pretty literally! I used the snowfall die on the blue panel layering the Country Landscape die over it - I adhered some yellow cardstock behind the door and window. The front panel is up on foam to give dimension to the winter scene. The Peace is from Nutcracker Sweet by Waltzingmouse. Accessories: Dies - Snowfall, Country Landscape, Medium Snow Globe - Memory Box, foam tape. Boy - I don't know what I've been doing - but I sure haven't been posting to the old blog! My other life (the non-stamping one!) sort of took over for a few days I guess - sometimes you just have to take a break, don't you know?! 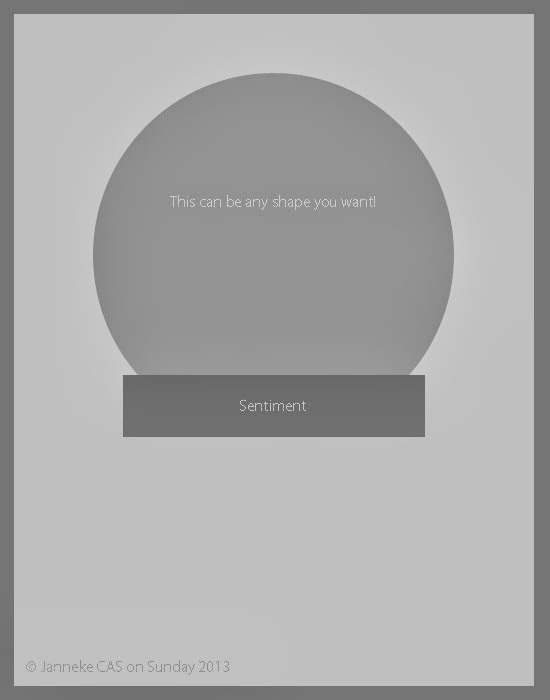 as well as the CAS on Sunday challenge - Welcome Home - make a new home themed card. Now my card has the sentiment 'Welcome to our Table' on it - and I'm thinking this could be a card to a new neighbor inviting them over - or it could be on the table when you have new neighbors to dinner - so it's kind of a loose translation of the challenge! 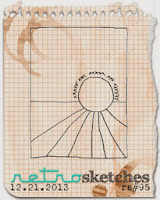 When I looked at the sketch and was trying to think new neighbor or new home to combine the challenges - I looked through my stamps for that theme and when I saw the Welcome to our Table sentiment (from Waltzingmouse - Country Labels 4) - the shape on the sketch suddenly became a table - I thought this piece of the MFT open scallop doily die looked like a lacy table cloth - so there it is - popped up on foam dots. 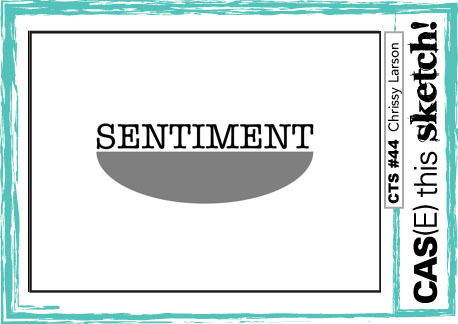 I just added two enamel dots on either side of the sentiment. 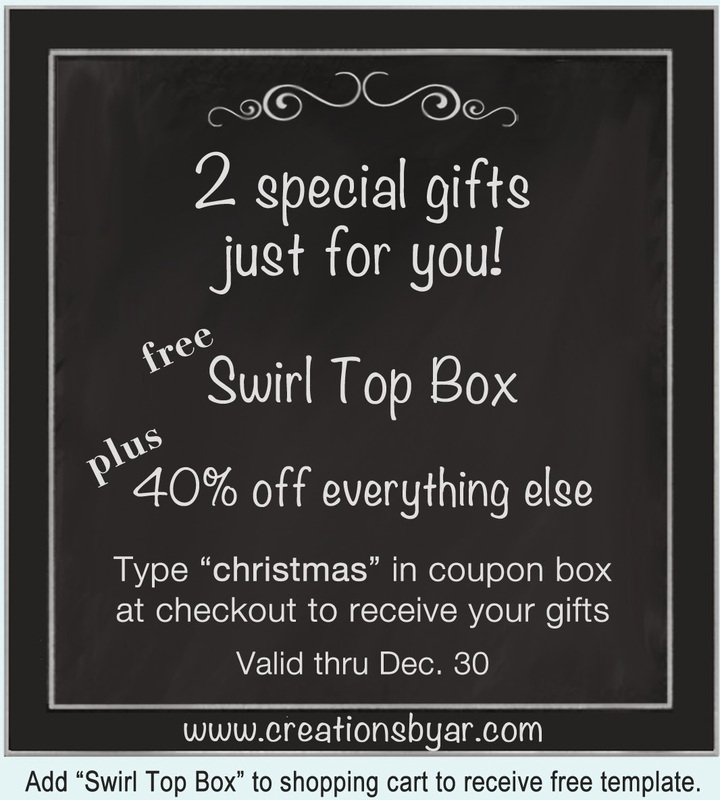 Lots coming up so I hope you'll stop by! I ended up making 5 cards using the same design with different ink colors since I had everything out on my work table. I stamped the bloom, masked it and stamped the leaves - then I simply stamped the luscious scrolly sentiment over part of the bloom. This is the first one I made using Ranger Distress Wild Honey, Crushed Olive, and Peacock Feathers along with Archival Black. 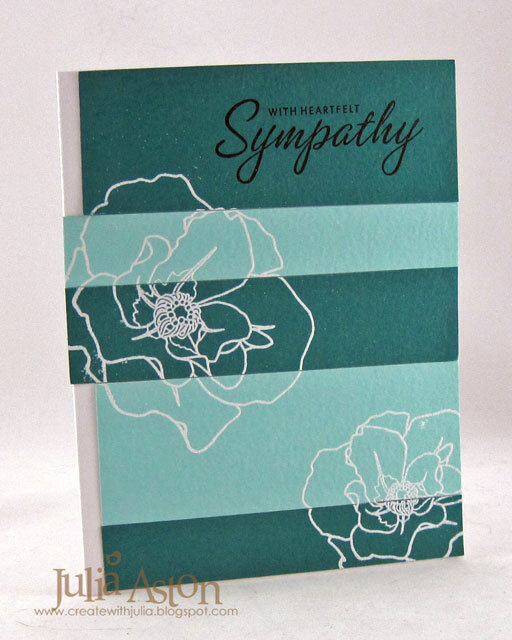 I added some enamel dots on the swirls of the sympathy sentiment. For each one, I stamped the images on a 4" x 5 1/4" white panel and adhered it to my 4 1/4" x 5 1/2" card - even though it's all white I think the layer adds depth and nice thickness to the card. 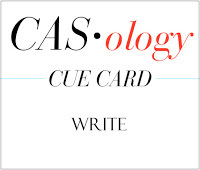 It makes a CAS card seem substantial! The flower, leaves, and stamen are from Funky Flowers and the lovely sentiment is from Big Day Today - both new sets from Waltzingmouse. The enamel dots are from My Minds Eye. Ink: Ranger Archival Jet Black, Ranger Distress Peacock Feathers, Crushed Olive, Wild Honey, Dusty Concord, Faded Jeans, Picked Raspberry. Accessories: Enamel dots - My Minds Eye. I've got a few CAS challenge cards to share today - I've been away from the craft room for a bit with all the Easter Prep last week! 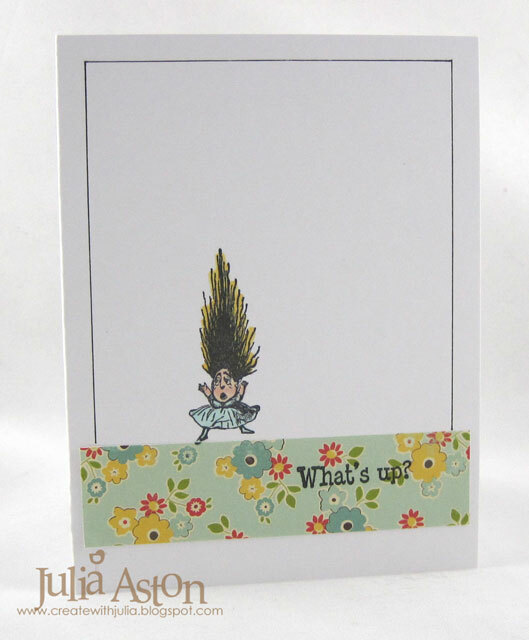 First here's a cute little 'hair raising' stamp from Picture Show for the CASology cue card - UP - the What's Up stamp is from Hambo Stamps. I drew the edge with a Fine Point Micron Pen. I used the colors (red, yellow, blue) from the SCS Color challenge. 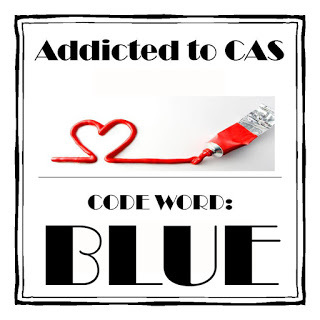 CAS On Sunday - Thank You. I die cut the front with a Spellbinders Label 18, the text and sending thanks stamps are from Waltzingmouse - they are stamped on the inside of the card- seen through the die cut-out on the front.. The big scallop edge was made with a punch from EK Success and the small scallop edge was made with a punch from SU. 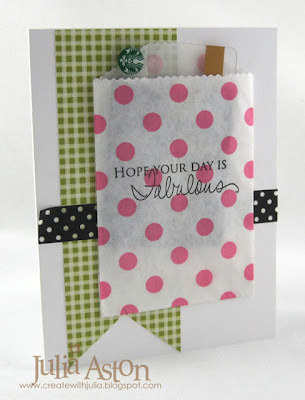 The stamp is from Papertrey Ink, and the cute polka dot mini bag is from Impress. I tucked a Starbucks gift card inside it. 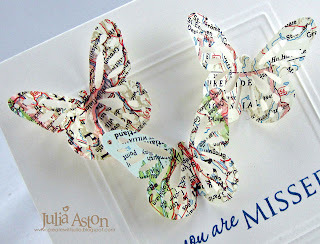 The SCS Try a New Technique challenge - Transform a map - I punched my butterflies out of a map from a National Geographic. 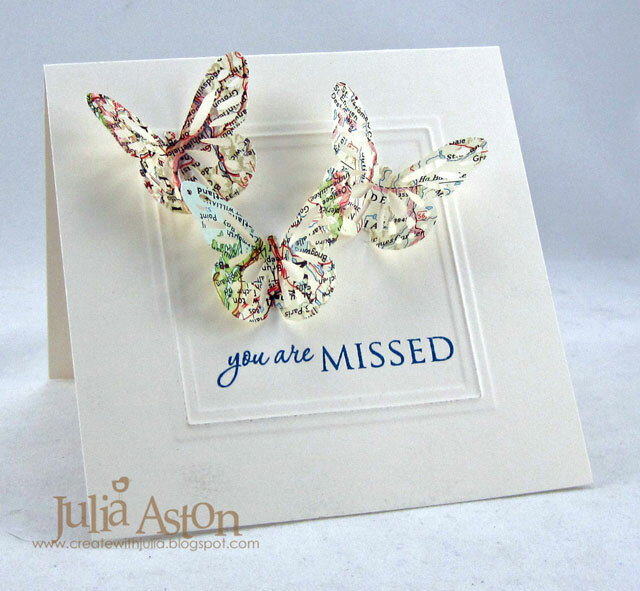 Less is More Challenge - Frame It - I embossed a square Nestability frame in the card base. CAS on Sunday - Flutterby - I used three butterflies on my card. 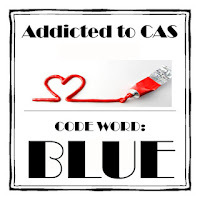 Addicted to CAS - code word WINGS - there are 6 of them on my card! I've been needing Sympathy cards for my stash so that's what I made my next card. I was inspired by the color stripes and white embossed flowers on this weeks Muse Challenge. Thanks so much for stopping by today. 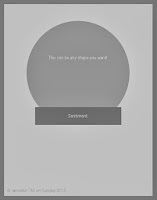 Wednesday I'll be posting a really cute Easter project using a template from Creations by AR. Hope you can come by then! 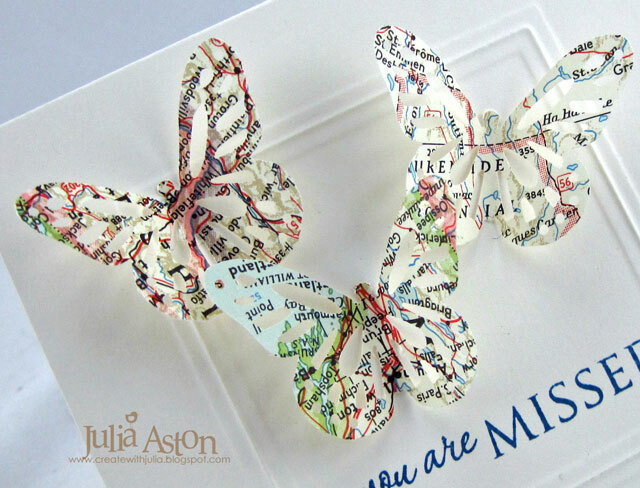 Accessories: Butterfly Punch - Martha Stewart, map - National Geographic Magazine, Square Nestabilities, glue dots. Anne LOVES red - so I just had to use as much red as possible on my FEEL BETTER card I'll be sending to her. I used several circle Nestabilities to make this card - the back of the card is cut with a scallop circle die (I cut across the bottom area so it will stand up and not lean forward since the front circle is smaller than the back!) I used two circle dies for the red and a heart circle die in Brushed Silver for the front. To attach the front to the back - I scored a line across the top of the front and adhered it to the back piece using Scor Tape. My cute little nurse cat is Nurse Sprinkle from the Cat's Pajamas (this may be retired - I couldn't find it on the site). My sentiment is from Say It Loud from Waltzingmouse. Inside (not shown) I stamped "I hope each day finds you feeling more and more like your wonderful self" - from Healing Touch Sentiments from PTI. I used two red Tiny Twinkles for Nurse Sprinkles eyes! 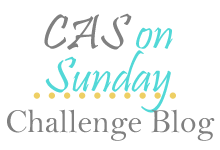 CAS on Sunday - making the rounds. 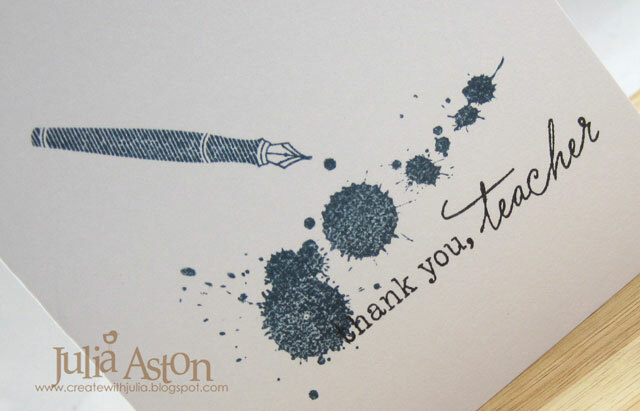 I hope you'll come by again on Thursday - I'll be participating in a Waltzingmouse DT Blog Waltz featuring our favorite stamp sets! 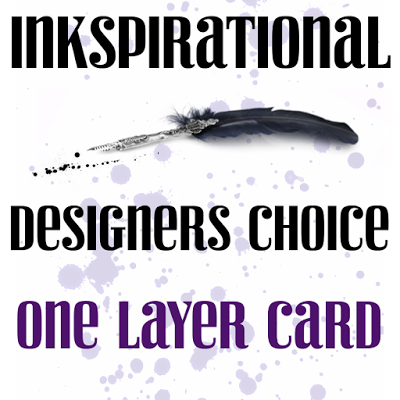 I think you'll be inspired! 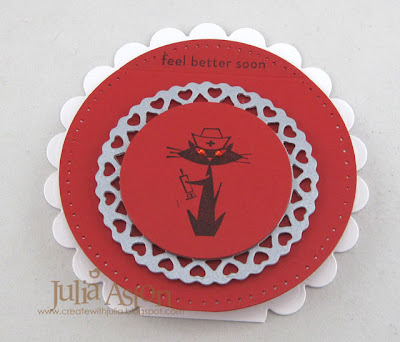 Stamps: Nurse Sprinkle from The Cats Pajamas, feel better soon from Say It Loud - Waltzingmouse. Accessories: scallop circle, heart circle and circle Nestabilities, foam tape, piercing tool and pad, tiny twinkles - Taylored Expressions.